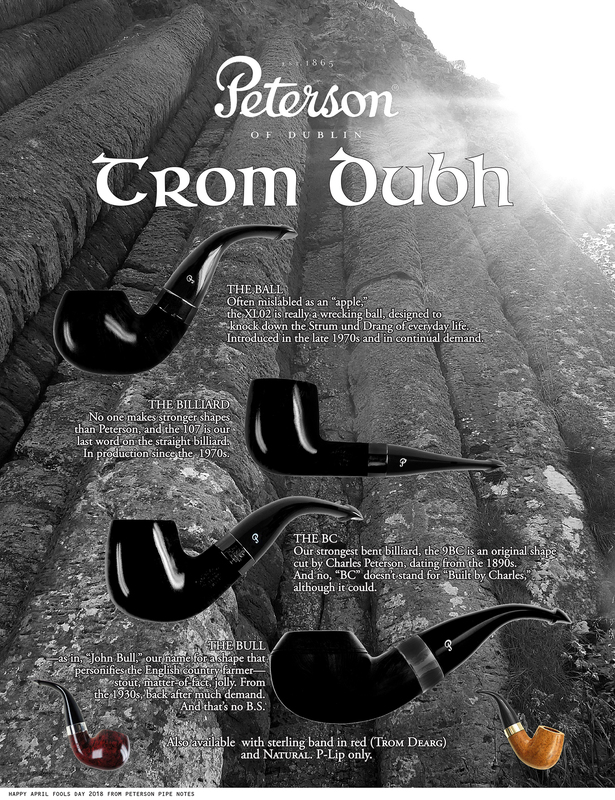 Along with other new lines and collections that will soon be available, Peterson has just announced a mid-grade set, the Trom Dubh (which in Irish means “chubby black”). Where to begin? The first connection between the shapes, as the name indicates, is in the “chubby,” but it’s really a heavy, and by that I don’t mean grams or ounces. It’s a visual heavy, a roundness in the hand, a muscular, massive sense of proportion, like the basalt columns from Giant’s Causeway Peterson chose for the digital strut card pictured above. Irish shapes have always been heavy-metal rebels when set against their English counterparts, analogous in the world of rock music to bands like Meshuggah, who not only play six and seven-string basses, but down-tune for a giant effect. The heavy metal analogy works in the second part of the name as well—the dubh, a black-on-black, with just that touch of silver in the hot foil P on the mouthpiece. The retro P-Lip, now in acrylic, just makes them that much tougher. THE B.C. is the oldest bowl shape of the quartet still in production, and is a favorite among estate collectors, where it is found as the 9BC, the BC designation indicating a tapered (B) short (C) stem. It originated in the 1896 catalog as shape 9, and most Kappnists* have at least one of these in their rotation in its various permutations—the XL90 Classic Range or 307 Standard or 9S DeLuxe System being the most commonly seen these days. The 9BC came to prominence in the US in the 1950s and seems to have been a special favorite of Rogers Imports Ltd., as most of them are found in the old Rogers Imports Shamrock line. THE BULL is the gem of the collection, being the original John Bull or 999 shape, a bullmoose which was first cut in the late 1930s or early 1940s. It was in production until the late 1970s, when it was phased out by what was originally called the 998, today’s 999, the little slipper rhodesian that is one of Peterson’s top sellers. Like the B.C., it’s an especial favorite among collectors, and given the popularity of the larger Savinelli 320 author shape (the difference between a bullmoose and an author being that bead around the crown), chances are it will be a solid hit for Peterson. THE BALL is a shape that was introduced with several other now-classic shapes in the late 1970s as the 02 DeLuxe System, 302 System, or (as it is here) the slightly-larger XL02 in the Classic Range. With the tapered P-Lip, it is solid in the hand and has always looked to me like the “P” in the Peterson logo brought to life in a pipe. Part of the freshness of this shape is that it hasn’t been seen much in this configuration. In fact, I’ve only ever seen it as part of the Emerald line back several years ago, and in the Sterling Silver Italian-release. THE BILLIARD is another shape introduced in the late 1970s (the 107) without much ado, but is a veritable billiard on steroids, and Peterson’s definitive statement on the subject. ‘Nuff said, as they used to say in the Marvel Bullpen. If you’ve been watching, Peterson is slowly tooling over to acrylic P-Lips. The choice to use the P-Lip in the Trom Dubh collection is probably risky, given the smoking public’s lack of understanding of how these perform. But it certainly accentuates the “fat” character of the collection, and will deliver superior taste and less moisture over a fishtail mouthpiece every time. I know I’ve caviled against acrylic stems in the past, but I’ve been smoking not only the 2018 POY, but a 312 acrylic P-Lip for a while now, and my reservations have mostly vanished. I don’t know whether the acrylic has gotten softer, the button a little thinner, or I’ve just gotten used to it, but I do like not having to stress over whether the stem is becoming oxidized. The combination of gloss black bowl with anodized black aluminum band is the kind of move we’ve come to expect from the new wave of Peterson pipes. I don’t think I’ve seen this kind of band on a pipe from anyone else, and I’m anxious to see one in real life. I’m told the idea for the set came from Fionn mac Cumhaill, one of the Sallynoggin artisans who hails from Northern Ireland. It looks like there will also be some higher-grade sterling band sets, both in the Trom Dearg (red) finish and in the Trom Natural. I’d expect to see the Natural sets out of Italy first, but maybe a few from Smokingpipes.com as well. These feature the inlaid aluminum P in the mouthpiece. I know everyone will be wanting THE BULL, and if past Peterson releases are any indication, we can probably expect this shape to appear solo before too long. The presentation box will feature a black and white photo of the famous basalt columns from Giant’s Causeway. Collectors can expect to pay about $460 in the US. The sterling band Trom Dearg and the Trom Natural will go for about $600 and $800, respectively. *Kappnist—one who studies or admires Kapp (& Peterson) pipes; a Pete Nute or “Pete Freek” with an eye for the history of the marque. Wow, what a surprise. I say the BC is the gem of the bunch! We haven’t seen a 9BC shape (XL90 is too large…) since the pre-Republic days. I’ll hope to see some additional pictures soon! I suspect the higher grades would move to vulcanite stems? The p-Lip is a no-brainer for this line, a good move by Peterson. Thanks for playing along, Al! Happy Easter (and Happy April Fool’s Day)! Oh man, that is cold! You got me good! I posted it to the PipesMagazine forum. We’ll see if anyone smarter than I caught on. Sorry guys, it’s April 1st. What can I say? It’s the only way I’ve figured out to release my own Peterson lines. I am pushing for a 999 John Bull release, though, so who knows? Mark, you’re a pipe tease. Actually, you mention of the Causeway got my attention more than the pipes as it’s only about 10 miles from my ancestral home. My wife and I spent a glorious day at the Causeway, where I took the photo in the electronic strutcard above. We hiked a good ways out to where it was all silent and sheep pastures overlooking the ocean–absolutely amazing. BTW, are you the gent who runs the Peterson Irish club on Facebook? Nope, that isn’t me Mark. Would love to visit the homeland but doubt we ever will. I believe this is a beautiful fake news. Thanks for the compliment! I try to make every April Fool’s Day something special.